As Shakir Jawdat, Chief of the Iraqi Federal Police, announced the complete liberation of the last, northern neighborhoods of Fallujah from Daesh (ISIS, ISIL), Prime Minister Haydar al-Abadi came to the city on Sunday to plant the Iraqi flag right downtown. al-Abadi, the commander in chief of the Iraqi armed forces, called on all Iraqis to issue from their homes into the streets and to celebrate the liberation of Fallujah. The popular mobilization units are the Shiite militias, deadly foes of the hyper-Sunni, Shiite-killing Daesh. The tribal levies are clans of the Dulaym in al-Anbar Province who opposed Daesh just as many of them had opposed al-Qaeda in Mesopotamia, the predecessor of Daesh that was organized to fight the US military occupation of the country. Tribes are kinship units in rural Iraq, and while they are religiously conservative they typically are not fundamentalists, and they dislike Daesh for condemning their Muslim traditionalism in favor of a hyper-fundamentalism. That al-Abadi and his American allies were able to have Shiite militias and Sunni al-Anbar tribesmen fight on the same side was a substantial victory of its own sort. He called for celebrations in each of Iraq’s provinces Sunday. Likewise, the head of the provincial governing council for al-Anbar, chaired by Sabah Karhut al-Halbusi, congratulated the heroes of the army and police for their defeat of the terrorist Daesh organization. He warned, however, that there were cases after liberation of arson, and called on al-Abadi to discipline the persons responsible. Karhut appears to believe that members of Shiite militias from the south were engaging in reprisals via this arson. He has been deeply critical of the Shiite militias in the past. 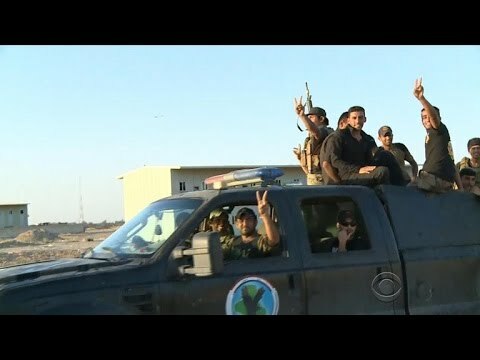 But there are hardly any Shiites in Fallujah, so this was an invasion from the Shiite south. If Iraq can’t find a way to get the Iraqi Sunnis to be in the same party with Shiite Iraqis, this sort of unrest could easily recur. In the end, Daesh and other al-Qaeda affiliates in Iraq and Syria can only truly be defeated by inclusive, non-sectarian government. But al-Abadi is the head of a Shiite religious party that no Sunni believes includes them. That has to change if Iraq is to survive.